Currently when I weave, I can do it anywhere in the house. That will become harder when I finally get dogs, because as anyone with a pet knows their fur gets everywhere. My craft room and main weaving space can be kept fur free quite easily, but the living areas like the lounge room, where I like to weave in front of a movie or do hem stitching on the couch, are tougher. Not that I can get furry dogs (allergies), but still. And I do want to get at least one rescue so I can’t be too fussy on fur types! I’m a while away from getting dogs (dodgy fences), so I have more time to contemplate solutions, thankfully. And, no, I will not turn into one of those people who wants to spin their dog’s fur into yarn!!! I’ll admit I haven’t given my Etsy shop the love it deserves. Quite a bit of that comes from having launched it and then had an immediate “why am I doing this?” moment. You see I got a bit caught up in the flattery of my friends who were all “you should sell these!” about my scarfs. What got lost somewhere in this was what led me to weaving in the first place; making things for other people. Specifically, I was knitting scarfs for charities. Having said that, it doesn’t cost much to run a little business there and takes very little effort. Both valuable to someone who works full time and writes novels. At the end of all my musings, I realised that the shop brings a valuable positive to my weaving life… you see I chose a specific theme for my shop: handwoven items, all one of a kind from my loom. No repeats. No colour variations. Unique items. And that pushes me to do more, explore more and challenge myself to create beyond trying patterns I like. So, the shop is back up with some new stock and there are bunch of new ideas brewing in my weaver’s brain! Based in Carloway on the west coast Norman, like many Harris Tweed weavers, has a single peddle powered loom which typically takes 600 ends of feather weight yarn and he weaves his cloth at home. He sends the cloth to a mill for finishing and then it’s certified as Harris Tweed from Carloway which his wife makes onto scarfs for their small shop but he mostly sells it as bolts of cloth. I’ll post a photo later of his loom. Of course I do listen to it most of the time and I regret every time I don’t. In this case it was entirely my fault that I ended up with broken warp threads left, right and centre. And now I have a lot of relatively useless thrums. Sigh. Well, it was pretty and fluffy and brightly coloured. Note the word ‘fluffy’ in that sentence. That was my downfall, because it abraded in the heddles rather severely. Afterwards, when I was enjoying a post breakage coffee, my yarn-senses tut-tut-ed at me. I promise I will listen to them in future. It’s likely that this will be the most common thing I end up asking myself during the next year of weaving. Not only are there just a huge number of things still to try, but I am also wanting to do variations on some of the things I’ve tried already! So, what’s tempting me currently? But it may well do my head in! I’m also tempted to try some leno ideas and some other finger-manipulated weaves, because so far I have only done a little and pretty half-heartedly. Then, I have an idea for some more crammed-warp pieces. Plus, the pinwheels are still very appealing to try. I suspect the leno or the crammed-warp will win simply because my double-weave adventures have given me a strong desire to do something fast and simple. Posted on January 6, 2016 January 2, 2016 Categories learner weaverTags my weaving, weaving2 Comments on What next? 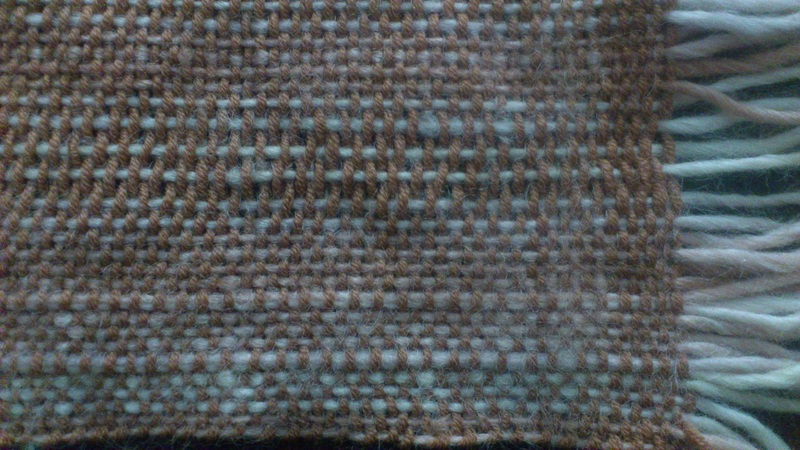 A common texturing technique, for use on any kind of loom, is to change the spacing of your warp threads. You can run extra threads through the same heddle (crammed warp) or you can skip a few (spaced warp). The crammed warp gives you raised lines which can be subtle or strong depending on the colour/texture of the yarn/s. Spacing the warp – depending on how spaced you go – will give sort of lacy tracks where the weft appears loopier and looser. Again it can be subtle or strong depending on the yarn combinations. While this turned out quite a subtle version, you can see toward each edge there are two lines of cramming and the tracks toward the centre are the spaced warp (skipping two threads in each). I like this warp patterning a lot, because it is straightforward and yet gives a wide range of possible results. Working with multiple colours in the weft has been a lot of fun, but it does require some thought on how you will carry your “inactive” colour up the selvedge. 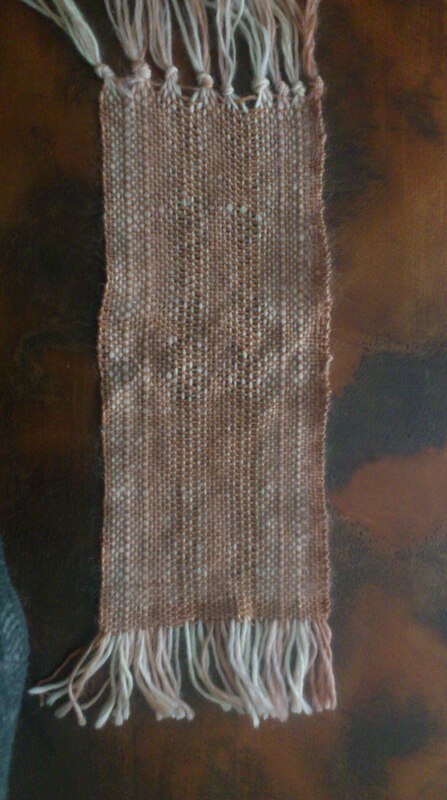 Well, at least if you’re weaving a complete product, like a scarf, where hairy or loopy selvedges aren’t a good thing. The important thing is to make sure the “active” colour – the one you’re about to put into the shed – wraps around the “inactive” colour. That way it will be pinned to the selvedge and not flop about! This does get a little trickier when you’re carrying a colour up a few picks of weft, but it’s usually easy to see what you need to do. Another consideration with two + colours is which side of the web to start them on. If you have the colours come in from opposite sides of the shed initially (and it’s an unvarying alternation of colours) then they kind of leapfrog each other. And if this is all as clear as mud, I’d recommend doing a small sample, because it’s pretty simple when you see it in action! When carrying yarn up the selvedge, the key is to be consistent, so you get a nice, neat pattern of colour at the edge. Something to keep in mind with alternating weft colours/textures is that, if the cloth you’re weaving is for cutting and sewing, then you don’t need to carry them; you can actually just cut the colour off with a tail at the selvedge and re-introduce it on the next pick where it’s needed. Though, I suspect this might waste more yarn than carrying…not sure.